Hahahaha. 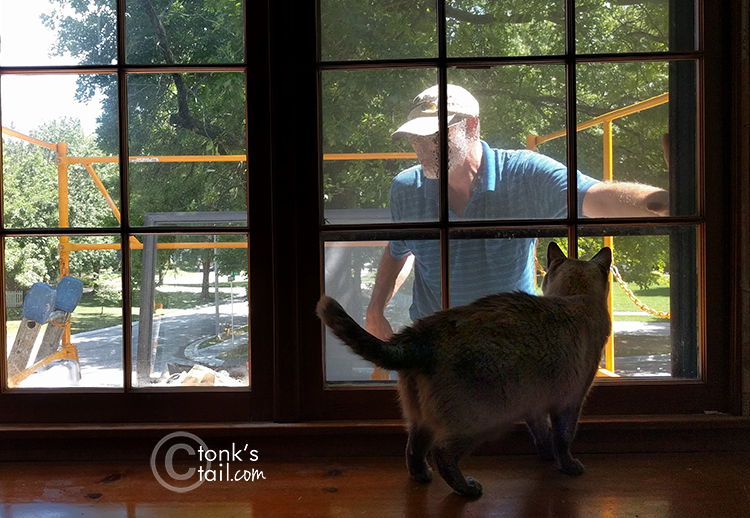 One time the lawn care people were doing something right in front of our bedroom window ... all of a sudden, I hear one of the guys cursing about "that damn cat who's watching everything." Yep. That's right. You steal his rosebush (the one he likes to hide behind in the garden when he escapes and doesn't want me to catch him) and there's going to be hell to pay! Lots of humans have loose screws! 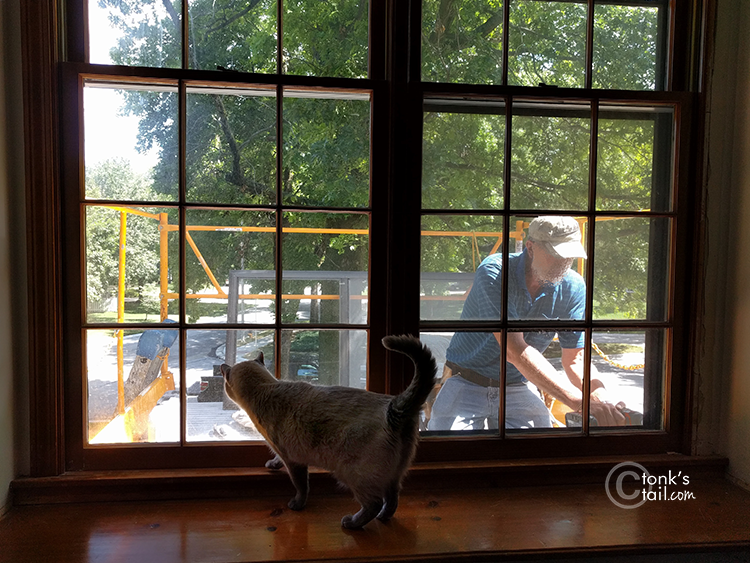 When my friend was building our catwalk, one of the cats loved supervising and was great at finding dropped screws. 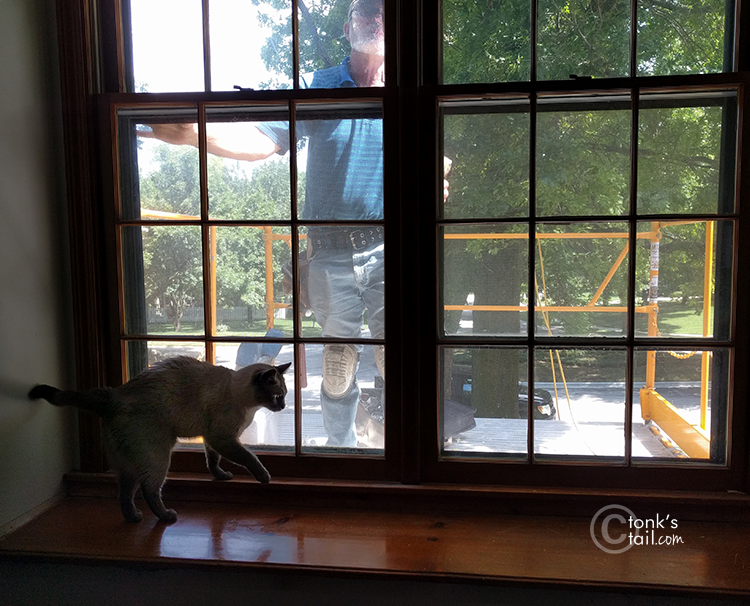 Maxie and my engineer-cat Mr. Sunshine have much in common when it comes to supervising work done on the house, including the man cutting up the old cast-iron tub with a Sawzall because it was the only way to get it through the door. He also steals my tools when I'm working on projects or framing. Maxwell, you're like Crockett - he always wants to snoopervise what's going on. Maxwell, I'm sure you were a fantastic supervisor. The windows look great. Maxie, sometimes not being able to hear has its advantages, doesn't it? Snoopervision, always needed for these people. Excellent snoopervising. You can't watch those guys too carefully. And also inneresting because TBT is thinking of doing the same thing. 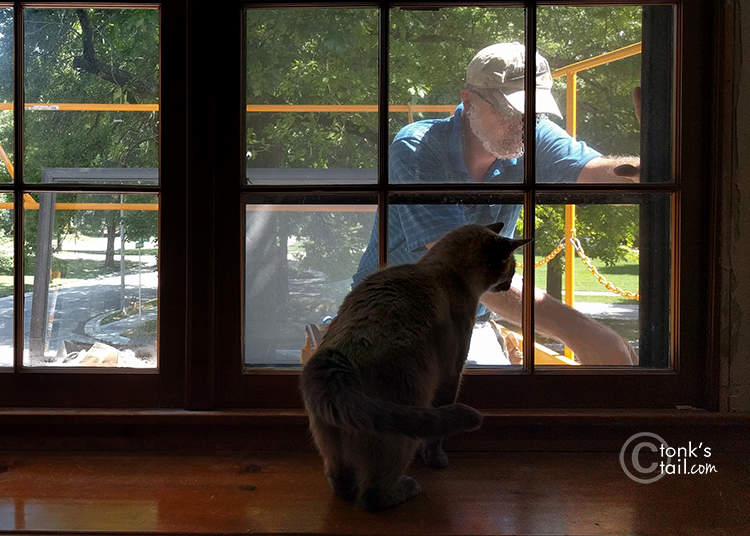 Our original cheap windows are 30 years old and he can't even open some of them. We went through that process in 2007, and replaced all the windows. It was fun to make sure the furs were in the room where the workers were not, MOL! Meowy good job, Maxwell. I have to watch my mommy all the time to make sure she's not messing up the house again. "Charles, I didn't mess up the house...it was a fire, remember? Now, we have all this space and you have lots of room to spread out." Looks like he needs to go get a job in construction and bring home some of those green papers for the family! Excellent job, Maxie. Hey, somebuddy's gotta make sure the job is done to specs! Max that was superb! You are the cat for the job of snoopervising. Oooh I say, maxwell, dude, you are so talented and way better a site manager than my peep. Are you available to project manage my extension, and there is a vacancy going for PM, I think quite soon which you would be brilliant at!